The shoulder has substantially four major bursae, namely the subacromial bursa, the bursa subdeltoid, bursa subcoracoid and bursa subtendinea musculi subscapularis. This with the joint fluid (synovial fluid) filled fabric cushion act as a buffer and overlay for each tissue, muscles, tendons and bones in the shoulder. Shoulder bursitis usually indicates that one of the bursae usually filled with little synovial fluid have expanded and are filled with more fluid. The sliding between the bursae and bony structures of the shoulder muscles and tendons then becomes trapped with severe pain usually accompanying it. In addition, the shoulder may swell visibly with the prominence of bursitis. It is, often easy to distinguish between acute and chronic bursitis in the shoulder. A typical occurrence of acute bursitis in the shoulder is shoulder pain and swelling which occurs very suddenly, whilst in chronic bursitis, the pain persists over a longer period of time or is recurrent. 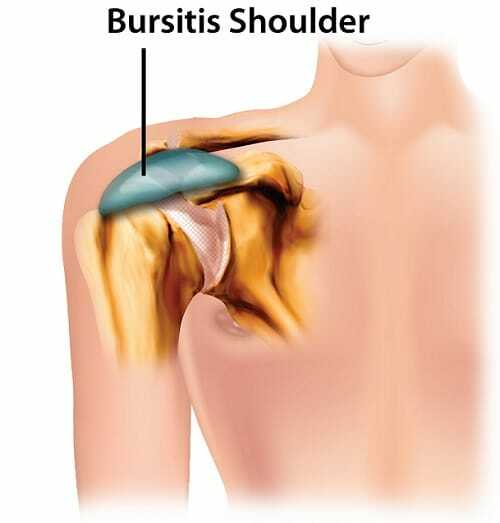 In some cases, chronic bursitis becomes acute bursitis in the shoulder if the therapy was unsuccessful and the primary causes are still present. There are various underlying causes of shoulder bursitis. In most cases, it is caused by a mechanical overload and overworking of the bursa in the shoulder, such as sports that involve high shoulder involvement e.g. javelin, tennis, handball, badminton, discus and shot put. It is also common amongst weight lifters and those who perform overhead work e.g. painters. Diseases such as rheumatoid arthritis, gout or tuberculosis. Shoulder disorders that can increase the risk of inflammation in the bursa due to mechanical irritation include impingement syndrome, shoulder stiffness and tears in the rotator cuff. Shoulder bursitis is usually accompanied by severe pain in the affected shoulder. This can occur both when moving the shoulder and even when it is at rest, for example at night when sleeping. Through the pain, the shoulder is sometimes limited in its mobility so that the individual can barely lift the affected arm properly. In acute bursitis of the shoulder, these symptoms usually appear suddenly, ie within a few hours or days. In chronic shoulder bursitis these symptoms are present for an extended period of several weeks and months and may get worse over time if not treated. Shoulder bursitis is usually diagnosed on the basis of the individual’s medical history, cause and symptoms. On physical examination, the doctor will more than likely immediately recognize the symptoms mostly typical with bursitis of the shoulder including the pain, limited movement and swelling that occurs. In addition to a physical examination, imaging techniques such as ultrasound, X-ray examination and MRI (magnetic resonance imaging) scans can be used to find the cause of a shoulder bursitis and accurately pinpoint the area of the inflamed bursa. Moreover, a punctured bursa in the shoulder will usually have liquid withdrawn from it, firstly to aid the pain and swelling and secondly to be tested at a laboratory. This is done in order to understand better the exact causes of bursitis. Medication therapy with anti-inflammatory and analgesic drugs which can also be applied to inhibit the inflammation and relieve the pain. If the bursitis was caused by bacteria, then it is usually treated with a of course antibiotics. If conservative treatment measures are not effective at treating the shoulder bursitis then surgical procedures such as a bursectomy may be necessary. With this surgery type, the inflamed bursa is arthroscopically removed through keyhole surgery.